What an incredible evening. I am really finding myself to be quite possibly the luckiest writer on the circuit. After arriving in the city, I hung around Greenwich Village and visited the old haunts of my grandparents and great-grandparents at 463 Hudson Street, the saloon that was in my family from 1906 to the late 1970s. A bit nervous about the reading, I had a few drinks while listening to some city workers and off-duty firemen grumble and bluff with thick accents and hearty laughs. It’s called Barrow Street Pub now and it’s just a few blocks down from the Barrow Street Theatre where the reading was to take place. The bar is close to the water on Hudson and Barrow where the old longshoremen of New York City used to hand over their paychecks to my great-grandfather behind the bar back during the times when Light of the Diddicoy takes place, 1915 and 1916. Later in the week, the longshoremen’s wives would come to the bar for the rest of the money. My great-grandfather Thomas Lynch, his wife Honora Lynch (nee Kelly) and their six children resided in traditional fashion, upstairs from the saloon. I often visit the old place, which is still kind of rough around the edges. As mentioned, I had a few butterflies to kill and felt a little better after a drink or two and some texting with close friends and family. When I walked into the Barrow Street Theatre an hour before the reading was to start, I saw Malachy McCourt up on stage with his cane. His command of the English language still at its peak and the charm of an old storyteller has settled in him nicely. I climbed up to be with him and after listening to him, the butterflies had disappeared entirely. “Do you ever get nervous, Malachy? Before going on stage?” I asked. “Yeah, we sure do,” said I.
I couldn’t have asked a better man for advice as he has seen and done just about everything a man of the stage could do during his time. 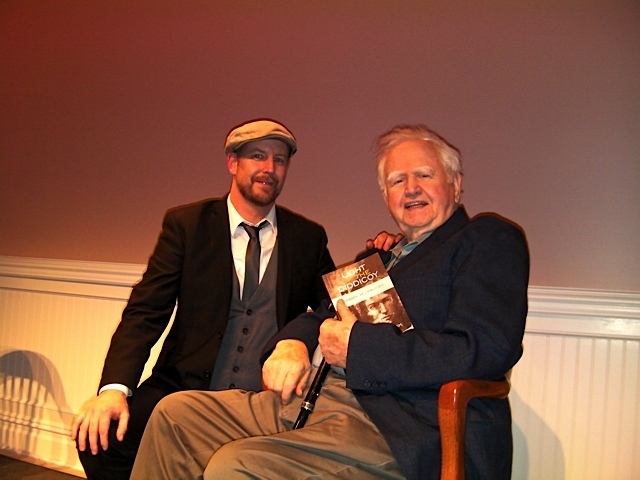 On and off Broadway, Hollywood movie roles, a regular on Johnny Carson, a saloon owner himself and author of the rollickingly hilarious A Monk Swimming, one of my all-time favorite books told in his own voice, which is to say the oral tradition of the Irish. Maybe one day I'll earn the right to have eyebrows like Malachy McCourt. It was here that I ached to interrupt him and tell the story myself as I am well aware of the ancient version. But realizing it’d be better to hear him say it, I kept my gob shut and my ears opened. I only smiled and confirmed that I too knew the story, having read it on the wall of the lobby of Lynches Castle in County Galway years ago (Lynches Castle is now a bank, or was at least when I was there). After the show, I was humbled by the compliments that came pouring in, but a good literary friend who runs a blog and knows quite a few things about book publicizing said that he was glad to see Light of the Diddicoy getting the right kind attention. Mr. Malachy McCourt as well, I must thank too. He has been a wonderful supporter both on WBAI Radio-NYC with me earlier in the week and reading from the book at the Barrow Street Theatre. 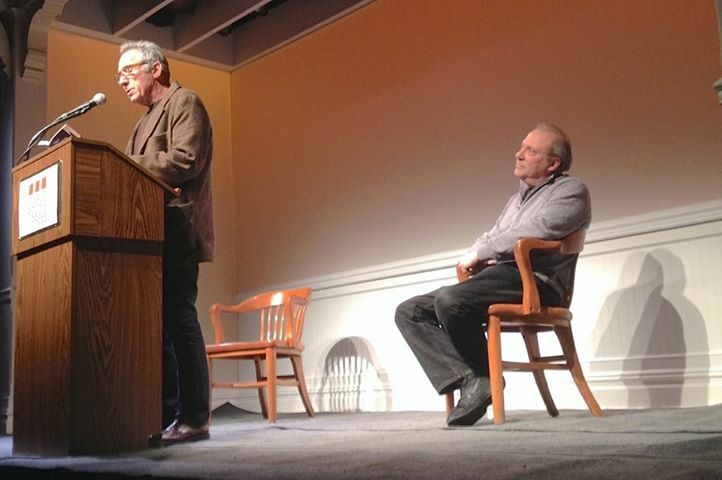 Also, I need to truly thank Richard Vetere and Israel Horovitz, because if it wasn’t for them the 200-seat theatre would hardly have been as filled as it was. Mr. Vetere’s book, The Writers Afterlife (also from Three Rooms Press) is a smart and fun read, from what I’ve heard so far. Thanks also to everyone who came and supported us and bought me Guinness at the old Lions Head bar (now called A Kettle of Fish) at the after party. Isreal Horovitz also read from fellow Three Rooms Press author Richard Vetere's new book The Writers Afterlife. Outstanding. Congratulations, Eamon ... quite a big deal. Looking forward to the big book launch in just a couple months! Oh, and Lynch's Castle is still a branch for AIB Bank. Galway City Council have mentioned, however, that they'd like to take the castle back and use it for something like a municipal arts centre ... which would be brilliant, I think, because how goofy is it for one of Galway City's most iconic structures to be used as a bank? Good point Ryan. It's really quite a neat little structure where the story is written in a way that you have to walk around the whole lobby to read it. It's like literature though, for us Americans who love hearing about our family's history. What an honor. Congratulations Eamon.